It’s an easy way to fit exercise into everyday life and you can usually make time for it as part of your daily routine. Walking to work, to the shops, to school or talking the dog out for a walk is a great way to make exercise a part of your life and to get to know more about your local community. While out walking there are opportunities to meet the neighbours, visit local shops, and enjoy public spaces such as playgrounds and beaches. Walkers also become the ‘eyes on the street’ that enhance safety and reduce crime. Kingborough Local Links is a great way for you to learn about the variety of ‘secret pathways’ and ‘hidden links’ in your local area. These links are often at the end of cul-de-sacs and link to a neighbouring street or park. When joined together, they create a pleasant walk around your neighbourhood and may even provide you with a ‘short cut’ to your closest shop, school, bus stop or playground. If you would like to know how far you can walk within a 10-20 minute time frame, you can either type in your address or click on your location and the map will let you know your nearest shops, bus stops, parks, schools and playgrounds, as well as the distance you can cover in that period of time. Kingborough also has a range of walking tracks from short easy strolls to full day and challenging walks, with some also suitable for dogs, horses and mountain bikes. Discover your local tracks; many have Local Links that will connect you with them. You will recognise the Tracks as they are coloured green, while the Local Links are coloured red. Please note that not all of these Local Links are sealed footpaths; some are grassy easements, stairways, ramps or a combination of all of these. Discovery is part of your adventure. 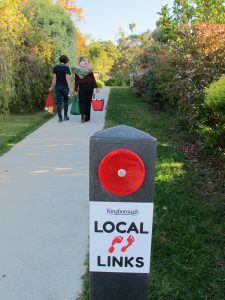 As you are walking around, look out for the Kingborough Local Links signage with the red footprints. If you would like to print out a map to take with you, use the print icon on the top right-hand corner of the screen, adjust the image on the page to suit your walk and then click Export PDF. This will ensure you get a good quality print.